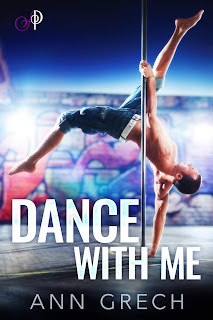 Dance with Me is the first book in the Under the Uniform series from Ann Grech, and it also happens to be my first read from the author. This was a quickie read about a twenty-four-year-old dancer named Eddie Taylor who's given the fantastic opportunity to be one of the performers on the MV Dreamcatcher. While going through a few moves, he finds himself being watched by a silver fox. The attraction is clearly mutual, but Eddie is taken aback when he soon realizes that the man before him is none other than the ship's captain, forty-three-year-old William Preston. Everyone on the the MV Dreamcatcher looks up to Will. He's respected and liked, and while he's friendly with the crew and staff, he would never become intimately involved with any of them. But then he catches sight of Eddie, and the feelings the newest dancer on the ship evokes in him has Will tempted like never before--not even by his own ex-husband. But can a man who's always abode by his self-erected rules break them for a much younger man and the promise of something wonderful between them? It's love on the high seas and below decks for these two. Learn more about Ann Grech. Purchase Dance with Me on Amazon. Thanks for sharing and for the great review!